I visited Rome with my family before I was a food blogger, and I spent a half hour or so just a few yards away from Forno Campo de’ Fiori without even knowing. Forno (the Italian word for “oven”) is known for Roman-style pizza — rectangular pizza served by the slice. When I heard that there was a Campo de’ Fiori pizzeria here in Park Slope (just a few blocks away from grilled pizza spot Fornino), I knew I had to try it. Rumor has it that they are affiliated with the Roman bakery, and that they even get their dough shipped in. On a cold November afternoon I stopped by for some Roman pizza for lunch. 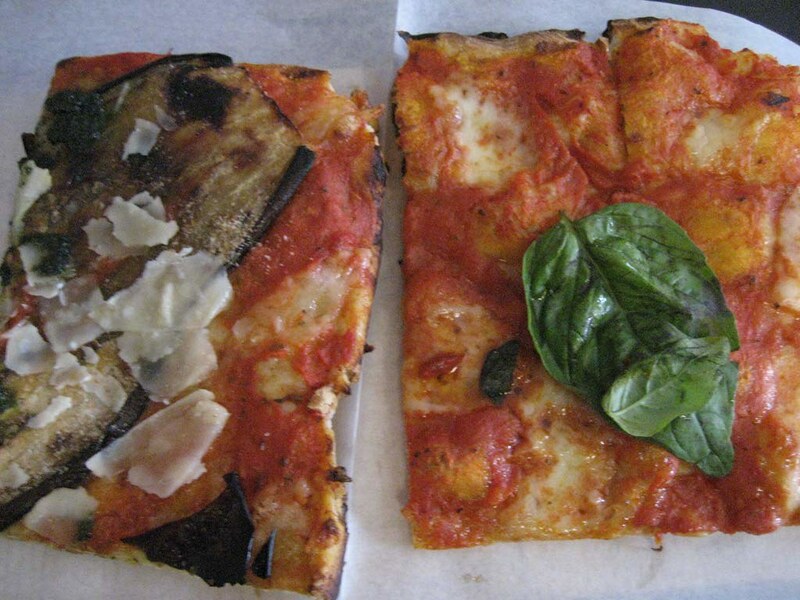 I got two slices: the traditional margherita ($2.50) and an eggplant slice ($2.90). The price of a regulare New York slice here in Park Slope is $2.50, so those prices aren’t really that outrageous. The margherita was fine, a bit overly crunchy, but the eggplant was really something special. Despite the fact that the eggplant was sliced paper-thin I could really taste its distinctive smoky flavor, and it was topped with some milky parmesan cheese. The servers were super friendly and attentive, and the pizzas came out on a cool wooden plank. These Roman-style pizzas aren’t going to replace NY or Neapolitan pizza in my heart, but the next time I’m on 5th Ave with an urge for a quick slice, I’ll be happy to stop by.